In front of the Eiffel Tower, on the opposite shore of the Seine and in the 16th arrondisement, this neighbourhood is also one of the quietest and exclusive in Paris. It is full of museums, as well as elegant restaurants and cafs. Surrounded by tree-lined avenues, the impression is that of being in a large garden. 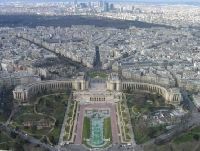 Home to most of the most renowned haute-couture boutiques, it also houses most of the foreign embassies in Paris. The neighbourhood was once the summer residence of the nobility. Even today, notwithstanding the distance from the city centre, there are still many beautiful and elegant buildings. At night many of the famous and trendy clubs stay open, from the Buddha Bar near Concorde to all the discos nearby in the avenue des Champs Elyses.